Written By Lieutenant Colonel Danny M. Johnson, USA-Ret. In 1954, the U.S. Army made an unprecedented move involving the Army National Guard (ARNG) to create an early form of full-time manning of hand-picked, continental U.S. air defense sites. 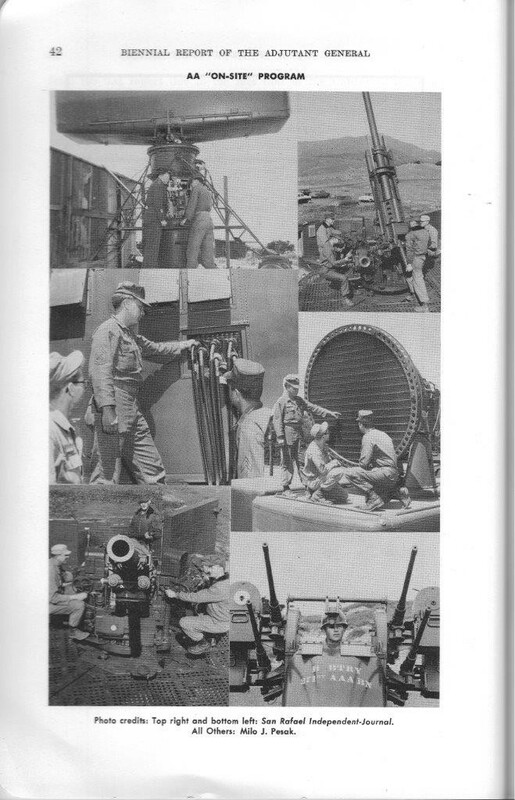 This program, called the Antiaircraft Artillery (AAA) On-Site Gun Program, utilized selected non-divisional air defense units situated throughout highly populated and key industrial cities in the continental United States. According to Headquarters, Department of the Army (HQDA), “The purpose of the National Guard ‘onsite’ program is to establish certain National Guard antiaircraft gun battalions that they may readily be integrated into the air defense system of the Continental United States.” In Northern California specifically, the Army called on the 271st and 728th AAA Gun Battalions of the California Army National Guard (CAARNG) to take over eight existing Army AAA gun battery sites in the San Francisco Defense area. A number of factors led up to this application of the Cold War-era National Security Council containment strategy. In 1947, with the discovery of Soviet long-range heavy bomber forces, the United States realized a pressing need for a more cutting-edge air defense system. Additionally, in 1949, the Soviets detonated an atomic bomb, a demonstration that alerted the Department of Defense (DOD) to the insufficiency of air defense in shielding major urban areas within the United States from enemy aircraft. As the U.S. Air Force was pressuring the Army to deploy AAA units around America’s strategic sites, the Korean War broke out, prompting DOD to take defensive steps. One of the Army’s major tasks in the early 1950s was ground-based air-defense of the continental United States. However, because the continental ground defense forces had shrunk to two regular AAA battalions by 1947, there simply were neither sufficient guns nor soldiers available for the mission. Six days after the invasion of South Korea by North Korean forces, the Army activated the Army Antiaircraft Artillery Command (ARAACOM). Soon after, General J. Lawton Collins, Army Chief of Staff (1949-53), proposed that the ARNG be called upon to defend certain vital areas around the country. In January 1951, Collins directed the Army G-3 to prepare a study called “Preferential Treatment of Selected National Guard (AAA) Units” with a view to future employment of state-commanded AAA units. By July 1953, HQDA had revealed criteria for designating ARNG AAA units as Special Security Force (SSF) units. This meant that “units had sufficient men and equipment and are well-enough trained to assume the responsibilities of a tactical antiaircraft assignment.” These units maintained their state of training with assistance from Army Antiaircraft headquarters. By March 1954, Battery A, 245th AAA Battalion (120mm), became the first on-site National Guard gun unit to join the defensive perimeter around New York City. Soon there were 105 National Guard AAA units in fourteen states, one of which was California, protecting sites of strategic importance. The Army followed special directives and conducted rigorous inspections of National Guard units subject to the policies and procedures for the on-site program. The on-site AAA gun program meant that guns and fire control instrumentation were in position, balanced and synchronized, and tied into the air defense structure so that weapon batteries could fire on unfriendly aircraft. The program was considered a short-term measure until the first cohort of surface-to-air missiles (SAMs), the Nike-Ajax, could be deployed later in the decade. .
One of the issues facing units identified for the National Guard on-site program was personnel strength. In 1953, the Korean War had just ended. ARNG personnel were being released from units, normal enlistments were ending, and it took time to process new enlistments. The CAARNG had twelve AAA battalions in 1954, all vying for soldiers. To help with the build-up of personnel, the National Guard raised its age requirements for enlistments for only AAA units. Initial enlistments were modified to permit men up to forty-five years old and reenlistments up to age fifty-five. Men with previous expertise in electronics who could support the gun sites’ radar equipment were extremely desirable. On-site units had to try and do their own recruiting within the local areas close to their gun sites. Units held open-houses to talk with young men and their parents about the serious work and the value of joining the National Guard. Normally, every M1 90mm AAA gun battalion was organized with a headquarters and headquarters battery, and four firing batteries—A through D. Each battalion was authorized an AN/TPS-1D radar unit which would track enemy aircraft out to a range of 160 miles. In addition, the typical firing batteries were authorized four towed 90mm guns and their ancillary fire direction control equipment. The M33 integrated fire control system was designed for aiming AAA by computer control and could compute firing data of 90mm and 120mm guns for targets flying at speeds up to 1,000 miles per hour at distances of up to sixty-eight nautical miles. The firing batteries were formed with four sandbag and wood plank semi-circular revetments within a square. A gun sat in each revetment thirty-five to fifty yards equidistant from each of the others. The fire control radar van stood behind the guns to eliminate having to adjust for viewing from different lines of sight. A typical gun crew consisted of eight or nine soldiers and included a section chief, loader, gunner, azimuth pointer, elevation pointer and a three- or four-man ammunition section. The crew that maneuvered the gun also maintained the weapon, which could fire a 24-pound round to an altitude of nearly 30,000 feet. A single 90mm gun could fire up to twenty-eight rounds per minute. In addition to the 90mm gun, Army AAA units fielded the heavier M1 120mm gun that complemented the smaller and more portable 90mm weapon in service. Although it had been intended to be mobile, the 120mm gun was located mainly in fixed sites. The 120mm gun’s maximum vertical range was nearly 58,000 feet, meriting the nickname “Stratosphere Gun.” Its rate of fire was 10 to 15 rounds per minute, with each round weighing some fifty pounds. The 120mm gun was used in AAA units from 1944 through the early Cold War period. It was eventually withdrawn from service with active duty units and replaced by Nike-Ajax SAMs. The two CAARNG battalions stationed in Northern California, the 271st and 728th, were instrumental in the success of the on-site program and were chosen because they were already located in San Francisco. Both had histories dating back to World War II. The 271st, organized from new and existing units, had begun its service in the CAARNG on 5 August 1946 as the 271st AAA Automatic Weapons Battalion. In January 1951, it was reorganized and redsignated as the 271st AAA Gun Battalion (90mm). The battalion was reorganized and equipped with larger 120mm guns in September 1954, but it remained a 120mm gun unit for only seventeen months before switching back to 90mm guns. It became the 271st AAA Missile Battalion (Nike) in March 1958. The 728th AAA Battalion had been organized in August 1946 from new and existing units as the 728th AAA Searchlight Battalion. It was redesignated in December 1947 as the 728th AAA Gun Battalion and redesignated in October 1953 as the 728th AAA Battalion. Headquarters Battery was relocated to Alameda in November 1954. 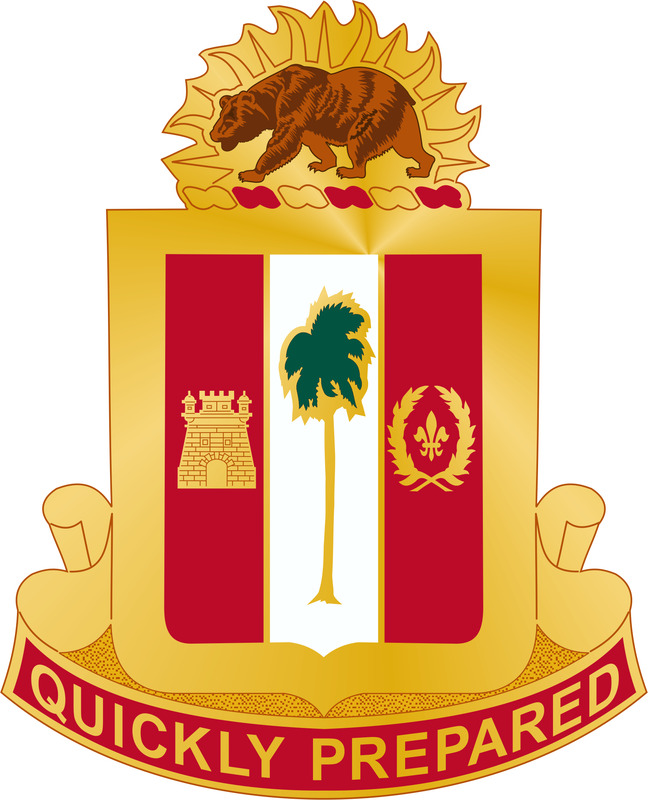 In March 1958, the battalion was reorganized and redesignated as the 728th Missile Battalion, and in June 1958, Headquarters Battery moved to Berkeley. With the creation of the Combat Arms Regimental System in 1959, the 271st and 728th Missile Battalions, along with 951st AAA Battalion, were consolidated, reorganized, and redesignated as the 250th Artillery on 1 May 1959. 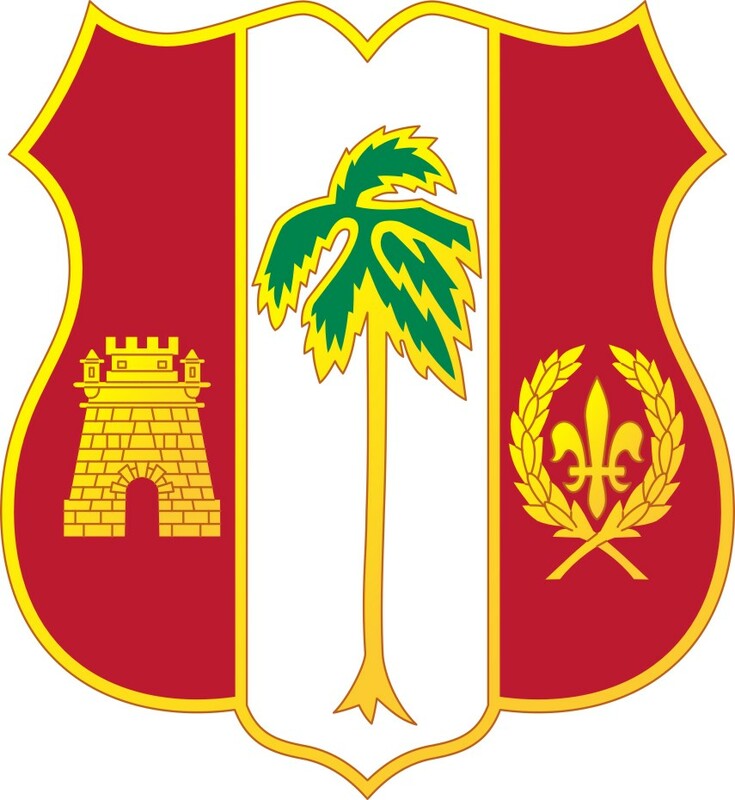 It was later redesignated as the 250th Air Defense Artillery Regiment on 6 July 1972 after the Army established Air Defense Artillery as a separate branch. When the 271st and 728th were assigned on-site missions in March 1954, both battalions were 90mm gun battalions assigned to the 250th AAA Group under the 112th AAA Brigade. These two higher headquarters were both stationed at San Francisco’s Mission Street Armory. Both the 250th Headquarters and Headquarters Battery (HHB) and the 728th AAA Battalion had been previously inducted into federal service during the Korean War, but both units had remained in the United States. After federal service, these units were allotted back to the National Guard. In 1956, the 112th AAA Brigade was commanded by Brigadier General James W. Cook and the 250th AAA Group was commanded by Colonel Norman W. Hemphill. The 271st and the 728th remained under state control, but they were also under federal operational control of the Western Army Antiaircraft Command’s 30th AAA Group at Fort Barry in Marin County. The Western Army Antiaircraft Command was redesignated in July 1955 as the 6th Antiaircraft Regional Command at Fort Baker. As such, these two CAARNG units would remain under state control unless mobilized for a national emergency. When the two National Guard groups moved on-site in 1954, they took over sites that had already been established in the San Francisco Defense Area by Army units, including the 9th, 740th, and 752d AAA Gun Battalions, some of which had moved to Nike-Ajax sites. 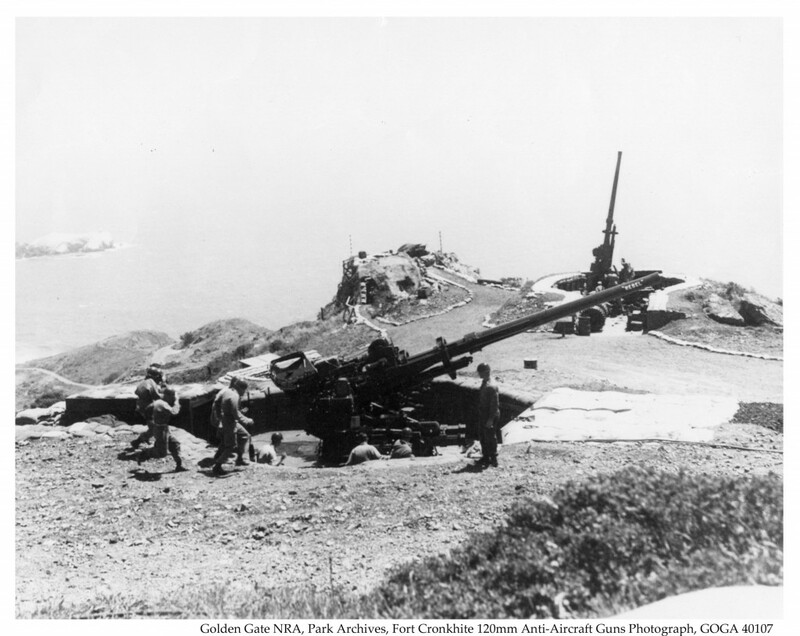 In particular, the 9th AAA Gun Battalion had established defensive gun sites in June 1951 at Fort Scott; Olympic; Radio Hill Point, San Bruno; Golden Gate Park; and Fort Cronkhite. Sometime after 1952, it also established a site in Tiburon, Marin County. The 271st and 728th AAA Battalions both moved from their regularly assigned armories onto their planned on-site defensive locations in March 1954. The entire 271st had already been stationed at Fort Funston, San Francisco. The entire 728th had been stationed at the Mission Street Armory in San Francisco prior to its move to Bay Farm Island, Alameda. In selecting specific AAA sites, the Corps of Engineers and the local ARAACOM leadership considered specific features of each location. These included land value, projected and planned development of the entire area, public relations with the surrounding neighbors, recruiting possibilities, the presence of utilities, and tactical requirements. In establishing military installations, the policy of the Army had been to choose sites that would be the least annoying to citizens in the nearby neighborhoods. At ARAACOM headquarters, the staff created a stimulating initiative for the development of temporary AAA sites. The Corps of Engineers procured sites as large as twenty acres either on government property or through leases from private owners. District engineers throughout the country let contracts and supervised the work done by civilian construction companies. Typically, every battery-sized unit was allotted eleven 960-square-foot pre-fabricated metal buildings: eight barracks, one day room building, one battery command post, and one maintenance building. In addition, civilian contractors would erect the required 1,020-square-foot latrine and a 2,300-square-foot mess hall/classroom building, as well as access roads, four gun emplacements, ammunition storage, radar pad, site preparation, and security fencing. The gun site revetments remained separate from the temporary housing and operational offices. The initial Army AAA troops were billeted in tents while the Corps of Engineers created additional facilities. The deployed crews often occupied Jamesway huts, which were comprised of a wooden framework protected by insulated canvas, or they could be housed, in some cases, in metal-shelled Quonset huts. While the soldiers often found these quarters less than ideal, they were better than sleeping on the ground. At each of these eight gun sites, fifteen full-time uniformed National Guardsmen maintained the permanently located equipment (guns and radars) on a twenty-four-hour basis as civilian technicians. In addition, each company- and battery-sized unit was authorized one administrative supply technician (AST), which performed unit administrative and supply functions on a full-time civil service basis for the unit. All technicians retained their National Guard status and participated in weekly drill sessions on-site with their units. 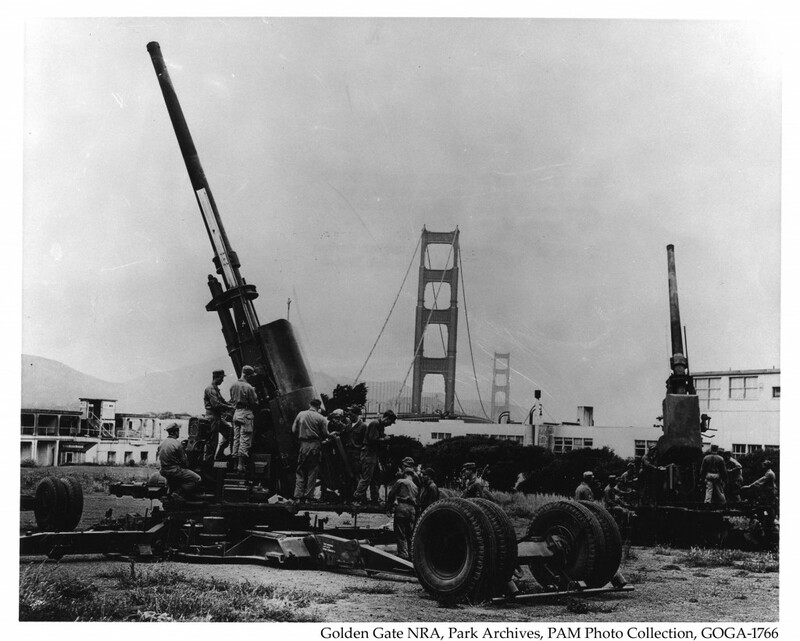 Chief Warrant Officer 4 Bill Hauger, site supervisor at Hunters Point, a long-time California National Guardsman, and former member of the 271st AAA Gun Battalion at Fort Funston said, “When we went on-site in March 1954, we got our 90mm guns from the Army. The departing [Regular] Army unit signed over all of their property, real estate, buildings and furniture, tactical equipment, and 90mm ammunition to our battery. Our battery brought small arms and ammunition, individual clothing and equipment, and vehicles to the gun site.” At the same time, the 271st and 728th turned in their outdated CAARNG guns and other large items of equipment. In order to smooth the transition from the Army to the National Guard at the changeover of the gun sites, the Army formed a rear detachment of twelve AAA personnel to remain on-site with AAA gun units and provide orientation and familiarization training to the new unit on the gun site equipment. The rear detachment would remain on site for approximately three months. Some sites required upgrades when the transfer of property took place. For example, Hauger recalled a funny incident relating to latrines while the 271st was assigned to the Hunters Point Naval Shipyard gun site. The latrines for the Army unit had been located in a gymnasium leased from the City of San Francisco. The Army had used the gymnasium for showering, sleeping, and latrine use. When the Army pulled out in 1954, the gymnasium was returned to the city. When the 271st arrived on station, there were no longer latrines available to the soldiers. Hauger said, “We found a manhole. We opened it up and built an outhouse over it. I then approached the battalion’s executive officer about getting something official built for the unit.” The executive officer took action, and the Corps of Engineers expedited letting a contract to build a “real” state-of-the-art latrine. The fifteen full-time National Guard technicians, spread among three eight-hour shifts, provided site security in addition to maintaining the site. Nevertheless, when major equipment needed repair beyond unit capacity, it was performed by other Army or CAARNG organizations. Tactical equipment maintenance support for the batteries was provided by Army shops located at the Presidio of San Francisco and Fort Scott. Real estate and buildings support was provided by the post engineer at the Presidio. Small arms support was provided by the CAARNG Field Maintenance Shop, and vehicle support was provided by the CAARNG Organizational Maintenance Shop located at Fort Funston. Because the technicians were not considered to be on active duty, they were required to bring their own meals from home for their shifts. However, on drill weekends the dining facility was open only for the noon meal. The food would be drawn from the Ration Breakdown Point at the Presidio of San Francisco. Finally, morale and support activities were limited at the CAARNG sites to their own intramural sports like basketball and softball. Since full-time personnel were limited to fifteen civil service employees, there was little time for MWR activities. When asked what technicians assigned to the 271st did on drill weeknights and or drill weekends, Hauger said that both full-time technicians and part-time Guardsmen “attended classroom instruction such as first-aid, weapons maintenance, and communications.” Gun crews trained on the guns and fire control personnel trained on their assigned equipment. When the two battalions traveled to Camp Irwin to attend annual training (AT) for annual service practice, the batteries left a security squad at the home station (gun sites). While at Camp Irwin, batteries went through an evaluation of battery operations, e.g. live AAA fire, mess hall operations, administrative and supply operations, motor pool, and housekeeping. Army evaluators graded units and provided an overall rating. At Camp Irwin, these units fired at long. Red, aerial towed target sleeves carried aloft by a U.S. Air Force B-26 towed target aircraft. These two units also fired at radio controlled aerial targets (RCATs). “These babies [RCATs] aren’t toy airplanes,” stated Master Sergeant Harry E. Palm, a former member of an RCAT unit. “They’ll do everything an airplane can do, and a lot of things an airplane can’t do.” The OQ-19 radio plane was 13 feet, 5 inches long, had a wingspan of 11 feet, 6 inches, and was capable of a top speed of 184 mph. It had a range of 122 miles, weighed 460 pounds, and had a ceiling of 15,000 feet. The RCAT could be launched from a catapult or off a trolley, and was recovered by deploying a parachute. It was driven by a single 72-horsepower, four-cylinder, air-cooled engine. This was more than it took to launch some lightweight sports aircraft of that era. RCAT soldiers had to uncrate, assemble, refurbish and service these craft. A number of aircraft were sustained on the ready line at the AAA range. The gun sites, in essence, became unit armories. James Gallagher, a former member of the CAARNG who worked as a civilian technician assigned to the 271st AAA Battalion from 1955 through 1959, said, “Our mission was the air defense of the San Francisco Bay Area. We graduated from 90mm to 120mm antiaircraft weapons and finally to Nike-Ajax antiaircraft missiles. The program was designed to replace military [personnel with civilian employees] in the defense program.” One advantage for the Army was that full-time civil service technicians were paid hourly employees and were not paid when not working. Also, state civil service technicians did not require mess and lodging provided by the military. Therefore, the on-site gun battalions were a reasonably priced unit for the Army as they employed full-time key personnel for less than half of what they would normally be funded. The fifteen full-time personnel at each site did not perform duty as units in the alert system. Rather they looked after security, weapons, radars, and ammunition to keep the sites fully combat ready in the event they were needed in an emergency or as backup. However, in the case of a potential air attack, all members of both battalions would report to their units. The battalion headquarters would notify the battery commander and site supervisor by landline as to the action required. This touched off a chain of phone calls to members of the unit. Soldiers used a “buddy system” to call unit personnel. Each soldier up and down the chain of command was responsible for calling a specified list of soldiers using a code word to recall unit personnel to the armory. Members then dropped whatever they were doing and made their way to the sites. Fortunately, while the members practiced this protocol, they never had to put it into practice. . The conditions of the original gun sites manned by the 271st and 728th Battalions have all changed over the years. The Presidio and Forts Funston, Baker, Barry, Cronkhite, and Scott are now part of the National Park Service’s Golden Gate National Recreation Area. Tiburon and Bay Farm Island are now large, exclusive housing developments. Hunters Point is now the site of several housing projects. The gun site at Golden Gate Park was returned to its natural beauty as part of the park. Bald Peak, a 3,947 foot mountain near El Cerrito, is part of Tilden Regional Park and now called Vollmer Peak, named for the first police chief of the City of Berkeley. The gun site at Point San Bruno is now part of the San Francisco Bay Trail System. The gun site at Olympic is now part of the Olympic Club golf links on the Pacific Ocean. The Mission Street Armory, which served as the headquarters for San Francisco’s two on-site battalions, as well as the 250th AAA Group and the 112th AAA Brigade, was vacated by the CAARNG in 1976 when functions were moved to the Fort Funston Armory. The Mission Street Armory was sold and has since become a private venture. The structure of the on-site gun program was sound and would be carried forward to the Nike-Ajax program. In fact, three CAARNG AAA battalions, two from Northern California (271st and 728th) and one from Southern California (720th), were reorganized and redesignated as Nike-Ajax missile units. 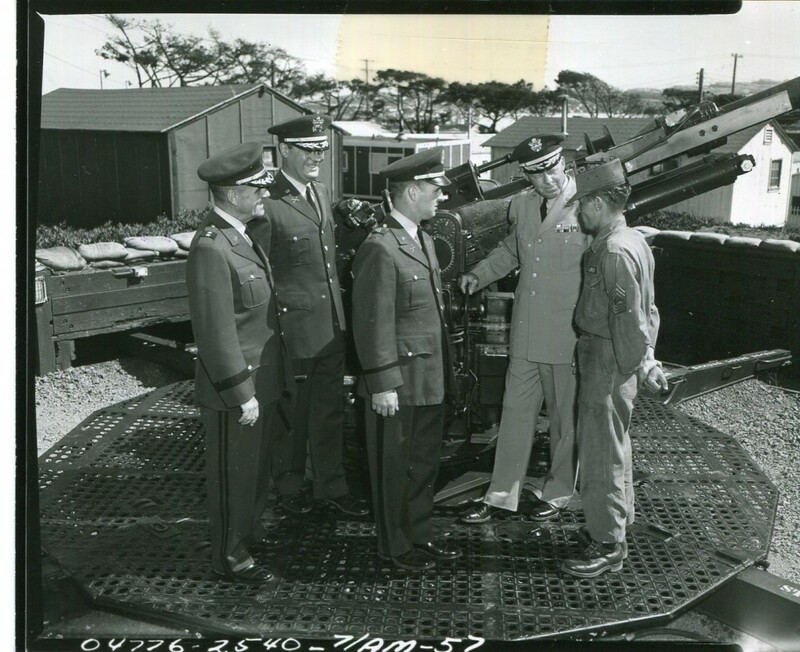 Officers and enlisted personnel from these units went to Army training schools or existing missile sites to learn the intricacies of the new air defense artillery weapon in preparation for their new assignments at the Nike-Ajax missile sites vacated by the Army. Once qualified, California Guardsmen returned to their home stations to finish specified Army and state unit evaluations before accepting full responsibility of the operations of those sites. With the start of the Cold War and the threat of long-range Soviet bombers attacking the United States with atomic weapons, the National Guard secured a new mission in its long history of supporting national defense. Starting in 1954, thousands of ARNG AAA personnel nationwide performed a vital federal air defense mission while maintaining state status. This was the first time in National Guard history that troops had been assigned to an active defense mission while still under state control. With the assumption of the on-site antiaircraft mission, the National Guard became a fundamental player in its longstanding participation in national security.